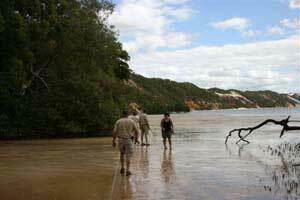 The picturesque settlement of Cooktown is nestled on the banks of the Endeavour River, at precisely the spot where Captain James Cook came ashore in 1770. He was forced to beach the Endeavour and spend a pleasant 48 days fraternising with the friendly natives while his carpenters laboured to repair his reef-damaged ship. Later, in the 19th Century, Cooktown experienced a population boom in the heady gold rush days. It boasted 30,000 residents and 90 pubs to slake the miner’s thirsts. It was 1873 when gold was discovered on the Palmer River, 120km inland - just over 100 years after Cook’s unplanned visit. The town sprung up from a few scattered tents and shanties to be the ‘Queen of the North’ then faded after 1900 when the easy gold petered out. It hung on as a service port until the road connection was made in the 1930’s, to be followed by another tumultuous period during WWII. Most residents were evacuated and the town hummed with activity as a front line military base full of US and Australian servicemen. Returning to a semblance of normality after the war, Cooktown was given a brief respite before the next calamity struck - a massive cyclone in 1949 that devastated the town. Cooktown has simply refused to die and today the original frontier town is a very peaceful and pleasant tourist Port, bedecked with palm fronds, frangipani and rainbow lorikeets. 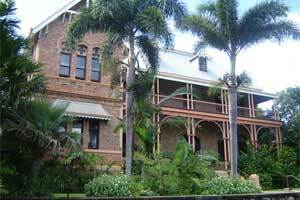 Some striking historic buildings remain including the James Cook Historical Museum, which was originally build as a convent. It houses the Endeavour’s anchor and cannons plus interesting interactive displays. The Cooktown Cemetery and Chinese Shrine gives a poignant insight into the early days, as does the Maritime Museum and the Powder Magazine. Rich tropical flora can be enjoyed at the Botanic Gardens and a stroll up Grassy Hill provides a stunning view of the waterfront. Cooktown cherishes its strong links with the past and stages an annual re-enactment of Captain Cook’s landing during the Cooktown Discovery Festival. Some 3000 visitors pour into town for the celebrations during Queen’s Birthday weekend in June. The ‘Queen of the North’ still preserves fascinating images and echoes of its wild colonial past. Long may she reign.